The Oak Alley Plantation was built in 1839 after two years of construction. It was built on land owned by Valcour Aime who was known as the "King of Sugar" and was one of the wealthiest men in all of the south. Valcour traded his plantation lands with his brother-in-law, Jacques Telesphore Roman for a plantation he owned in 1836, and Roman began building the present structure the next year. It was most probably designed by Romans Father-in-law who was an architect, though it is not known for sure. The house was built entirely from slave labor and the plantation had a number of small brick buildings for them to be housed in. The most notable of these forced laborer's was a man named Antoine, who was known as a gardener/expert grafter of pecan trees. He cross bred pecan trees with such skill that he actually created a new kind of pecan known as "soft shell pecans" which have an outer shell so soft you can crack them with your bare hands, and today they can be found throughout the south of the state. As for the famous oak trees the plantation is named after these were planted sometime during the 18th century, long before the house was built, but it is not known exactly who placed them there. After the plantation passing through various owners and under going a number of renovations it finally became a national historic landmark and is now open to the public for functions such as weddings. 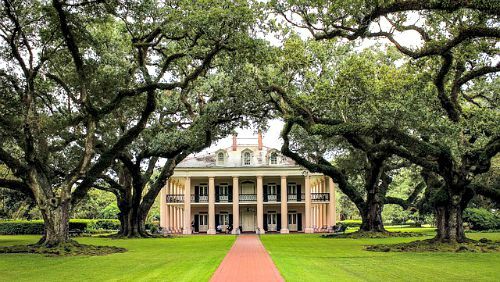 Is the Oak Alley Plantation Haunted? All of these plantations seem to be haunted by the same source, which was the slaves forced to work here. If anyone was going to "stick around" because of their mistreatment in life there are few out there who could match what these men and woman went through. All kinds of stories relation to them have been reported, with apparitions and shadowy figures creeping round the trees being common. As for the oak alley itself one such strange occurrence comes from staff and visitors alike, and that is the mysterious sound of a horse drawn carriage coming down the main path. It only seems to happen after dark and it fades away just before arriving at the house. The TV show "Ghost Hunters" filmed an episode here in 2008 and captured some interesting EVP and strange activity. But nothing seems to match the fright which 35 visitors to the house experienced one evening. They were all together in one of the rooms and suddenly a candle stick flew off one of the tables and hurled itself across the room in front of everyone.